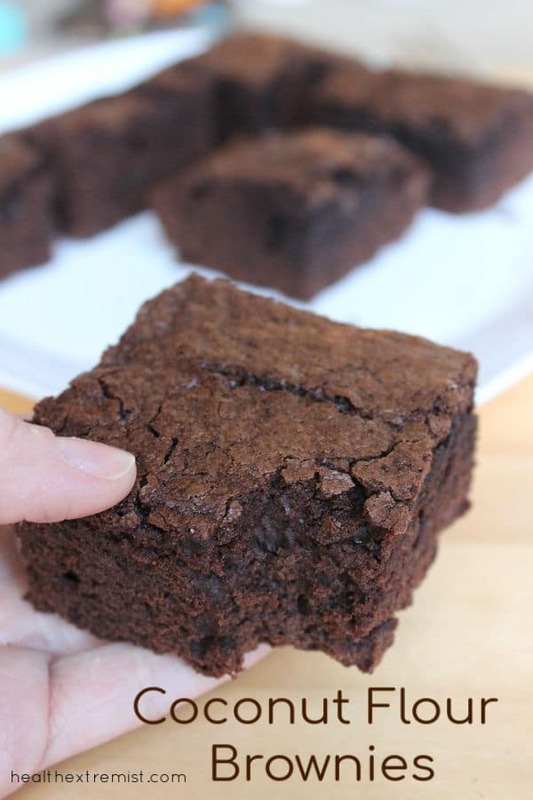 This is my all time favorite recipe for paleo brownies. The brownies are made with coconut flour and they taste amazing! They are soft, chewy, chocolatey and oh so delicious! Brownies were always my favorite treat when I was a child, but when I went gluten free five years ago, I gave them up! At the same time, I stopped eating processed foods, so this made it even harder for me to find a great tasting gluten free brownie. But guess what? 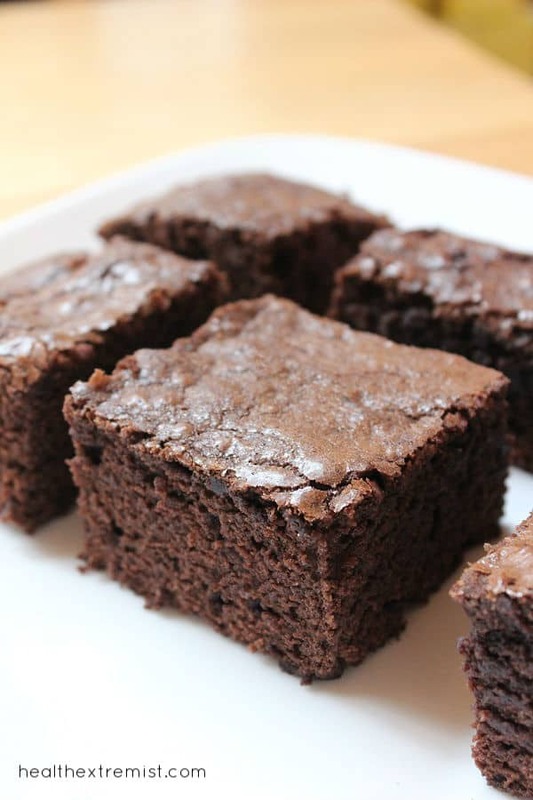 This recipe makes a great tasting brownie with healthy ingredients! These paleo brownies with coconut flour and raw cacao powder are the greatest, they take me back to my childhood! These paleo brownies would be a perfect treat for any holiday party! They taste like a brownie/chocolate cupcake and everyone who has tasted them doesn’t believe they are gluten free! You know, how with some coconut flour recipes, the coconut flour dominates the taste? Not with these though, it must be the delicious chocolate made from cacao powder! It makes these paleo brownies taste exactly like a regular brownie made with conventional flour. Seriously! One great thing about these paleo brownies is that they are sweetened with raw honey! Sweetening with raw honey is so much better than using sugar. Sugar is empty in nutritional value and lacking in vitamins and minerals. Honey, on the other hand, has vitamins, minerals, antioxidants and flavonoids that fight free radicals! It is a great natural sweetener! Also, if you are restricting your sugar, you can decrease the amount of honey and I’m sure these brownies will still taste great! I always try to use raw honey as a natural sweetener in most of my recipe because of the health benefits. 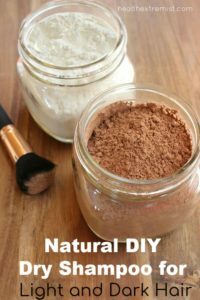 It works great as a natural sweetener for paleo cupcakes and muffins too. The main two ingredients for this recipe for paleo brownies are coconut flour and raw cacao. I love baking with coconut flour because it contains a high amount of fiber and it is also low on the glycemic index. 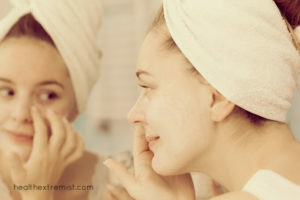 I’ve been trying to keep my diet restricted to a primarily low glycemic diet to see if it will help my skin. So, even when I make desserts and treats, I try to keep those as healthy as possible too. These paleo brownies don’t contain any gluten, grains, nuts or dairy. So, they are a great option if you have allergies or are just trying to eat healthier. It’s hard to tell that they don’t contain any gluten or regular sugar because they taste so great! My family usually can’t tell whether I made them regular brownies or my paleo brownies. That’s how similar they taste and look to regular brownies. 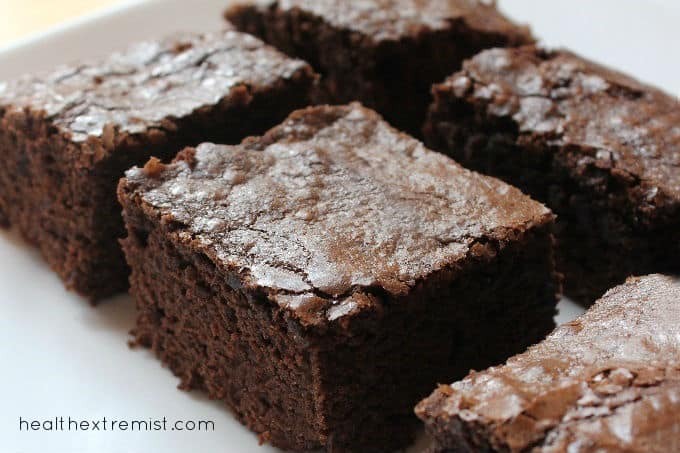 I love these brownies because they make a great treat! I usually bring one for a snack on the go. Try them, I’m sure you’ll agree, they are so…yummy, soft, moist, and melt in your mouth!!! 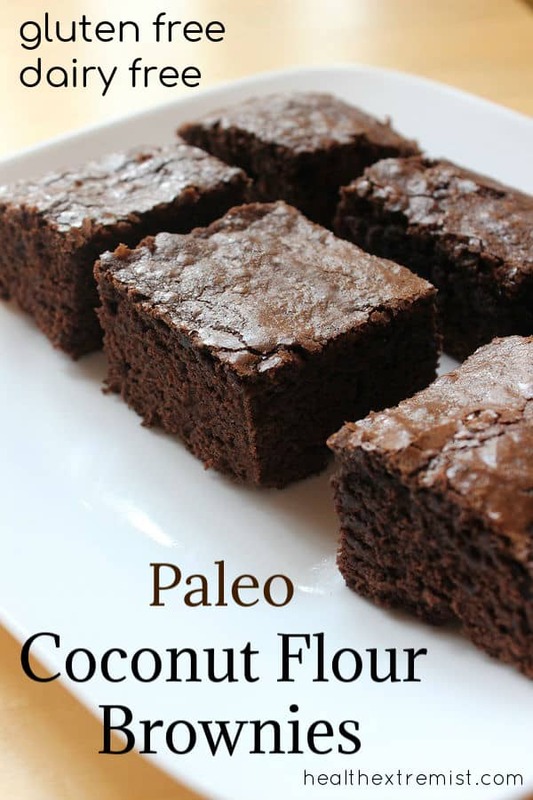 Recipe for paleo brownies made with coconut flour and raw cacao. 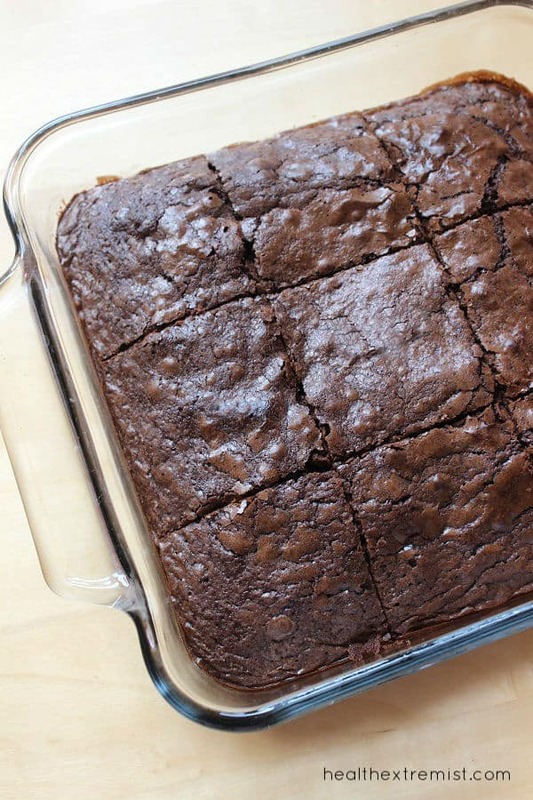 These brownies are soft, chewy, and melt in your mouth. The brownies are gluten free, grain free, dairy free and paleo. Combine all dry ingredients in a dish and mix well. Combine all wet ingredients in a separate dish, mix well. Slowly add the dry ingredients to the wet ingredients, while stirring. Grease an 8x8 baking pan or place parchment paper on the bottom of the dish. Pour batter into baking pan and smooth out the batter with a knife. Bake at 350 degrees for 30 minutes. Let cool before slicing. Hi Lori, I am making this brownies as I speak. I was gooey and trying to spread it around. I hope it taste good. Also, you said it wasn’t going to taste like Coconut but I tasted it and it did taste like coconut oil or flour. Can I use raw butter next time?? Hi Yoli, I haven’t tried making it with butter, but if you do, let us know how it comes out. I’m surprised you could taste the coconut, for me, the chocolate really covered up the coconut taste (or maybe I’m just too used to eating coconut lol). Funny I found this recipe while searching for a recipe that uses coconut oil (and flour) rather than butter. Not that I’m opposed to using butter, but have more coconut oil on hand right now than Kerrygold butter. The odd quantities bother me, though… 1/2 cup minus 1 TBL… but turned out well enough—we ate all of it!! LOL. But will use Lori’s recipe now. Thank you. Didn’t turn out and don’t know what I did wrong! Hi Debbie, sorry it didn’t turn out, did you make any substitutions? How can it be adjusted to also accommodate egg and dairy allergies? The recipe is dairy free, you could try substituting applesauce or chia seeds for the eggs (I haven’t tried it yet, though). Can I use stadia instead of honey? I’m on a gestational diabetes diet but I’m craving the delicious brownies! Well, I made these brownies with Almond flour and they taste better with raw butter but it’s weird, the coconut brownies tasted more moister than almond brownies. I only used 3 egg as the recipe suggested, should I try adding more eggs? I also added some non GMO, gluten free, dairy free dark chocolate chips on top. That was Yummy!! Sounds delicious with chocolate chips! Maybe try adding another egg or some coconut oil? Hi Lori – just found your website and sounds like some great recipes to try. My only issue will be the honey that you use in most of your recipes. I need to use low carb option, so I am wondering if you have tried using Stevia or other sweetner? I am just not sure whether the moistness would suffer or if I should I add a little more liquid to offset. Any suggestions would be appreciated. Hi Lori, You can definitely use stevia or another sweetener in place of the honey. I also make all of the recipes without any honey (or any other sweeteners) for my mom because she doesn’t want any added sugar, and they come out great. The only recipe I haven’t tried without honey, is this Paleo Brownies recipe. I made them tonight using natural mate a sweetener made up of erythritol and sucralose. They turned out great! Thanks for an amazing brownie! what conversion did you use to sub the sweetners for the honey? Do you know how many this makes? Sorry to hear that, did you make any substitutions to the ingredients? If you bake goodies, doesn’t that take away all the health benefits of the cacao being raw? It still contains some nutrients and I prefer it opposed to the highly processed cocoa. Hi, I made these last week…they are so tasty! I am going to make them again today, but I just wanted to say that when I made them they had the consistency of cake rather than brownies. Still very yummy, just more cake-like…I wonder if I over-baked them…I just put the timer on for 30 minutes, and didn’t remember to check them prior to that to see if they were done. My hubby, who is not a fan of my “healthy” dessert recipes, ate two pieces as soon as they were cool enough…which makes them a winner in my book! Glad they passed the hubby test! They are a little more of a cake consistency because of the fluffiness. How much truvia did you use please? hi made these today they were very very dry I didn’t substitute anything what did I do wrong? also only filled half the baking pan. Sorry to hear that, did you measure the coconut oil when liquid? These brownies were very very good and I added choc chips and walnuts. Stayed very moist. Next time add xanthum gum to help it stick together as I had to used egg substitute. Really yummy. Yum! I’ll have to try them with nuts and chocolate chips. Fool proof recipe, so easy to make & it comes together in no time. I wouldn’t mess with the ingredients as it’s a crowd pleaser as it is. Super chocolatey & gooey. So good. I work out around 100 calories if cut into 15 serves. PERFECT!! Thanks Lori! These are awesome brownies! My family loved em. I used butter, turned out amazing! Yay! So glad everyone enjoyed them! Can you substitute Maple syrup for the raw honey? If so how much would I use? Absolutely! I think you can use the same amount or a little less. I am wondering what the nutrition is with this recipe. I made it and it is wonderful. But still would like to know the carbs. etc. Hi! I would like to try this recipe for Thanksgiving. I usually buy the large brown eggs, should I still use 5 large eggs or less? Also, do I used the same amount of butter as coconut oil if I am substituting? Thanks, excited to try this recipe!!! I made these yesterday and they were great! I used butter instead and they turned out great! I’ll have to try making them with butter, it sounds great! Instead of honey, can I substitute that for medjool dates? How much do you recommended? Sure! I’ve actually never baked with dates before, so I’m not sure how many, but I would guess to use about the same (1/2 cup). Thank you for the recipe, these taste great! I altered mine a little. Once I poured the batter into my baking dish I swirled some almond butter on top. Just a tip…either used fractionated coconut oil or let your eggs become room temp. My cold eggs hardened up the oil and it was a big clumpy disappointment. Thanks for mentioning that! Whenever that happens to me, I stick it in the oven on a low temp for a minute and it melts the coconut oil in the batter. How many calories are these? I haven’t calculated it yet. There are websites where you can input the ingredients and it will calculate it for you. Made these after hunting for coconut flour recipes, cooked them in a loaf tin and it’s come out like a delicious cake! Would definitely feel better than eating regular cake, tastes delicious (very chocolatey) and I am going to serve it with a coconut milk & avocado based chocolate mousse as a “health by chocolate” cake over Easter. Thank heaps Lori for all the healthy recipes! Yes, so excited to try all these yummy healthy recipes! Love life and life will love you back by eating and staying healthy. I made these and realized I wasn’t going to eat it before going out of town. I was worried they would go bad in the fridge. I decided to freeze them, if it didn’t work then what did I loose. These freeze great!!!! Thawed just fine, and are still moist and super delicious. Also whipped heavy cream + a little vanilla. (Add stevia to sweeten if needed) goes great with these. So glad you enjoyed them! I like to freeze any extras too. Such a great treat!